New Zealand North Island Self Drive. Read about our campervan holiday around the North Island. On our second self drive holiday in New Zealand we chose to discover the North Island and we were in for a treat. From the moment we landed in Auckland we found a choice of destinations and activities that had something for all the family. The shopping and sightseeing in Auckland, the wineries of Hawke Bay, the natural beauty of the New Zealand coastline including Cathedral Cove and natural sea caves to the fantastic and envigorating natural mineral pools dotted throughout the island. We were in for a treat. Read all about our 14 day trip through this picturesque country. Tip number 1 with campervans, if you have a late flight it may be cheaper to spend the night at a close motel/hotel and pick up the camper the next morning. Our flight was delayed which meant we were unable to pick up the camper till the next day, so we lost one day`s payment. Auckland, the city of sails has much to offer. We enjoyed some shopping at one of the Westfield shopping centres, with the exchange rate the Aussie dollar goes a lot further. Take a drive through the CBD and explore the viaduct , with over 20 restaurants and cafes to choose from it is a great place to sit back and relax and watch the world go by. Take a walk up the Sky Tower, be a dare devil and do the bungy jump or enjoy a meal in the rotating restaurant, a 360 degree view of the city. A great place to get your bearings and decide what to do next. We also recommend taking a ferry across the harbour to Davenport on the North Shore. Stroll along the many beaches and discover the colonial architecture this quaint village offers. A day trip to Rangitoto or Waiheke Island also offer a range of experiences for the New Zealand visitor. A must see spot on your North Island trip is Piha Beach, this wild black sandy West Coast beach is rugged but gorgeous at the same time. At low tide there is much to explore along the beach, view the keyhole and take a wander around to the blue pools. Take a dip in the ocean but alsways remember to swim between the flags. Feeling adventurous, tackle Lion Rock at the Northern end of the beach or take a bush walk and learn all about the logging trade of the local area in the early 1900`s. It`s a beautiful walk through the bush beside the creek up to the waterfall. Very pretty walk, don`t forget to take the mossie spray! Stay at Piha camp ground, a great spot for the kids with open spaces to run and a purpose built park to keep them entertained. Facilities include a kitchen, tennis court along with clean amenities all withing walking distance to the beach and across the road from the shop. On your way back to Auckland stop at Elevation Cafe and Restaurant for spectacular views over Auckland City and surrounding districts. Enjoy a coffee, glass of wine, snack or a meal in relaxing stunning surrounds. Leaving Auckland we headed south, stopping at one of Auckland`s historic land marks, One Tree Hill. Set in a gorgeous park we found it an ideal spot for lunch, leafy trees and play equipment made for a relaxing lunch. Take the road up to the top of the hill for spectacular 360 degree views over Auckland City. Leaving Auckland we head towards Miranda, an easy drive along the motor way and then through farm land with scenic views of the Firth Of Thames in the distance. Miranda Van Park http://www.mirandaholidaypark.co.nz/offered more than we originally thought, not only was it the cleanest park we had ever stayed in but it had fantastic facilities for families. A range of accommodation from van sites, motel rooms, studio apartments, 1 and 2 bedroom chalets and lodges for upto 10 people. Facilities include trampoline, playground and cubby house for the children. TV internet and lounge area as well as a mineral pool. This was fabulous and like all amenities at Miranda Van Park was immaculate, being closed each day for cleaning. Drive up the road along the Firth of Thames scenic drive to the local hotel and fish and chip shop. Gorgeous scenery and we also discovered a free camp spot right on the water. No facilities but free camp sites are a rarity in New Zealand. The mineral pool is a popular place first thing in the morning and a great way to start the day. Headed off towards Thames for a fuel and food stock up before heading across to the Coromandel. A scenic drive with lots of windy roads but lots of places to stop and take in the views. We headed to Cooks Beach for a quick look, a great winery called Cooks Beach Vineyard http://www.cooksbeachvineyard.co.nz/ is well worth a stop…..awesome chardonnay. Cooks Beach is a sleepy little place with a beautiful beach and great for fishing, boating and safe swimming. The local camp ground was going through a total renovation and not operable when we visited but is a great place to stop and spend a few nights http://www.cooksbeachcamp.co.nz/ . Take a drive to the local lookout for stunning views of Cooks Beach and the Coromandel. We headed on to Harhei for the night, only a short drive. The local camp ground is set in a great location, close to the beach and if you visit Harhei in a quieter time of the year you may be lucky enough to get a camp spot at the top of the sand dune overlooking the beach. Harhei is a stunning part of New Zealand and we chose a local tour operator to showcase what it had to offer. Dan at Whitianga Adventures http://whitianga-adventures.co.nz/ has lived in the area all his life and very knowledgable about the landscape and flora and fauna in the area. We were blessed with a stunning day and the landscape didn””t disappoint either. Dan picked us up from Harhei Beach right in front of the camp ground and showed us along the spectacular volcanic New Zealand coastline and the sea caves that have been in the making for hundreds of years. They were simply stunning and we were able to enter a number of these caves to be able to take in the full extent of this stunning landscape. We also boated around Champagne Rock, Stingray Bay before we opted to be dropped off at Cathedral Cove and take the stunning walk back to Harhei. Cathedral Cove is a stunning sheltered bay which is a popular walking destination for tourists. An easy walk even with the children, took about an hour to return to Harhei but we were not in a hurry and regularly stopped for photo opportunities. Remember to take food and water, there was a makeshift tent selling drinks and food but locals were working hard to put a stop to this. 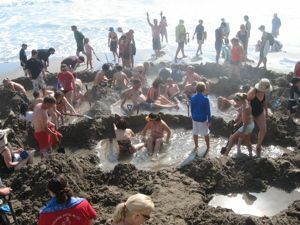 Hot Water Beach is a natural phenonomen which sees tourists flock to the beach with spade in hand to dig themselves a hole to sit back and enjoy the natural hot water that rises out of the ground. Check the tides as it is only really viable one hour each side of low tide. Lots of local businesses display tide times and also hire spades for the experience. This was a very popular spot during our holidays and we saw the population of Hot Water Beach almost triple. There are some awesome cafe and restaurants in town and surfing is a popular past time. A nice place to spend a night or a few hours. We left Hot Water Beach and headed towards Tauranga and `The Mount` as it is affectionately named. Mt Maunganui is situated in the city of Tauranga in the Bay of Plenty region of New Zealand. It is New Zealand`s favourite summer holiday destination with its white sandy suurf beach on the ocean side, and a safe sheltered inner harbour beach. Mount Maunganui is also the name of the extinct volcano which rises above the beautiful Mount Maunganui surf beach. We stayed at http://www.mountbeachside.co.nz/ at the base of The Mount and directly opposite the beach. This place had a feel like Burleigh Heads with its Esplanade Shops, variety of restaurants and tourists. A very popular destination and it is easy to see why. The Mount is covered in walking tracks and at any time of the day there we oodles of walkers enjoying the range of tracks which cater for all abilities and all with stunning ocean views. Spend some time enjoying the beach and walk to the sounthern end where the land juts out allowing you to walk along it and take in the scenery back towards the Mount and down towards Papamoa. Amazing views of the local islands the stunning beaches. We chose to explore the harbour with Phil and Adventure Sail http://www.adventuresail.co.nz/ We enjoyed the scenery and even saw some penguins!!! We left port and entered the bay, allowing us to fully appreciate the mountain. A stunning morning and one we all enjoyed. Leaving Mt Maunganui we headed south to Papamoa, another beach front area which has seen huge amounts of developments in previous years. We stocked up with food and petrol before heading towards Rotorua. We picked a great time of the year to travel……….berries!!! Blackberries, blueberries and raspberries by the punnet we devoured and they were cheap. We travelled pack lots of little vans who had set up on the side of the road selling not only berries but a range of stonefruits, avos and some vegies. All very cheap and very fresh. We arrived in Rotorua and chose to stay at the Rotorua Themal Park on the outskirts of town. Again like many parks in Rotorua it had its own mineral pools, of differing temperatures as well as a fresh water pool for the children. We spent quite a lot of time in the pools over the 3 days that we stayed here. The park was quite spacious and campervan areas were set in shady areas all close to the large kitchen and dining room. The amenities were clean with ample hot water. Rotorua has to be one of my favourite places in the North Island and this is my 3rd time here and we just had to revisit the museum, the Redwood Forest and the Luge and Gondola, a big day. The museum is set in gorgeous grounds full of roses and parks for the kids to play on. Take a drive through the grounds to the lake in the centre of town. This is one of 16 lakes in the Rotorua vicinity and provides a number of activities. Check out http://www.rotoruanz.com/ for activities to do in the Rotorua district. We headed to the Redwood Forest, this amazing forest is full of redwoods and New Zealand native bush. The forest has been sign posted with many running and mountain biking tracks to choose from. Children were given age appropriate questionaires to complete focusing on conservation and appreciation of the park as well as look and find activities which kept their attention as we spent over an hour exploring this amazing place. Great gift shop with a range of souvenirs and the girls handed in their completed activity sheets to receive a certificate and lolly pop. A great way to encourage conservation of the bush. Off to the Gondola and Luge on the outskirts of town. This is owned by the same people as the Gondola and Luge in Queenstown so we knew what to expect. Lots of fun!!!!!!!! Again, awesome views over Rotorua and the lake on the way up to the top and fast trip to the bottom of the hill before jumping on the chair lift to do it all over again. Heaps of fun for the whole family. For dinner we attended a Maori cultural show and traditional hungi at Miti Maori Village http://www.mitai.co.nz/ It was set in the bush with Maori locals who entertained us with traditional songs and wardances. We particularly enjoyed the Waka (boat) arrival with its warriors in traditional dress with weapons chanting their songs. The setting was supurb with the natural clear spring and river providing a wonderful back drop complete with glow worms. The meal was great and we thoroughly enjoyed our evening, sharing it with a range of people from over 15 nations world wide. This amazing place is thousands of years in the making at allows you to explore the geothermal landscapes and witness such amzing sights at the Champagne Pool (clear bubbling pool), naturally coloured pools, mud pools, steaming grounds and huge volcanic craters. The pools were amazing colurs due to the minerals that were in the water. It was an amazing place and one of only 4 areas in the world where you will see a landscape like it. The park was well set up and very informative making for an enjoyable morning. Drove on to Taupo, stopping at Huka Falls – torrents of water cascading down from Taupo Lake to a stream before spilling into a wider lake. The amazing force of the water turns the water a beautiful blue colour due to the levels of oxygen in the water. Drive through Taupo, set around the lake fringed with lake view houses and some lovely cafes and restaurants. On to Napier, quite steep mountainous drive, nice scenery of New Zealand natural bush and streams with pine plantations and grape vines as you get closer to Napier, which is situated in the Hawke Bay wine district. Stayed at Kennedy Road Holiday Park, it was a good pick with close proximity to town, shops and it had great facilities for the kids including a jumping pillow, climbing equipment, swings, trampoline, heated pool and bikes for hire. Explored Napier, a popular tourist destination with a unique concentration of art deco everywhere you looked. An interesting city with a good range of shops and activities. Lots of vineries to visit in the area but we chose just a few, Mission Estate http://www.missionestate.co.nz/ and Church Road http://www.churchroad.co.nz/ which are situated close to the centre of town. Both offer wine tasting and winery tours and We loved the setting of Mission Estate which is in an old restored seminary and historic tours are held daily. It has a lovely restuarant in the garden beside the water feature, a great place to stop and have lunch. Both have amazing wines and we were excited to hear that most can be easily purchased at good bottle shops in Aussie. We then headed to Hasting and the Havelock area to visit Black Barn, Te Mata and our favourite Craggy Range. Black Barn winery is an amazing place offering accommodation, concerts and running a farmers market on Saturday mornings during summer. Local produce is vaired and plentiful in this area so if possible organise your holiday to explore on a Saturday http://www.blackbarn.com/ There wines were very enjoyable but not available in Aussie so a few were purchased to be enjoyed once we arrived home. Te Mata is another local winery making beautiful wines in the same vicinity. http://www.temata.co.nz/index.php Visit Te Mata Cheese factory http://www.tematacheese.co.nz/ for beautiful cheeses, we really enjoyed their washed rind cheeses, especially the Irongate. Driving to Craggy Range Vineyard was an amazing drive. The vineyard is set with Te Mata Peak as its backdrop, simply stunning. We left Craggy Range and took the beautiful drive along the Tuki Tuki River through farm land to Cape Kidnappers Camp Park. Very basic park but set right on the beach which the girls enjoyed. A surfing haven as we discovered as surfers came out of the woodwork at high tide. We enjoyed the long twilight as we watched the surfers and the surf…….very rough,windy but beautiful. A beautiful place to explore with a prestigious golf course here as well as a gannet colony. There is another van park, Clifton Motor Camp which is also situated right on the beach, has a boat ramp and is within walking distance to the gannets http://cliftoncamphawkesbay.co.nz/ A must visit is the local cafe situated in Cape Kidnappers, a beautiful spot for brunch and coffee with the biggest coffee cups in New Zealand. Headed off to Paraparaumu (north of Wellington on the beach) via the Tararua Ranges. This too is a stunning drive with the ranges in sight all the way with their wind turbines sitting on the top of the range and then through the gorge with its deep valleys, stunning scenery and railway tunnels. Lots of fresh fruit and vegie stalls along the road and also many farms allow you to buy direct from the farm, so great to stock up with the essentials. Stop at Otaki for a great range of shopping before heading to Paraparaumu - which is the main town on the Kapiti Coast and is a popular holiday destination for Wellingtonians. It is well serviced with a range of shops, boat ramp, golf club and a range of holiday activities. Check out http://www.jasons.com/New-Zealand/Paraparaumu/ for what they recommend. Continue on to Wellington and the choices for activities are endless. Wellington offers visitors a vibrant and sophisticated city experience set within a natural amphitheatre of a harbour and lush green hills. Check out http://www.wellingtonnz.com/australian_visitors/theres_so_much_see_and_do/wellington_highlights for a range of itineries depending on the amount of time you have to spend in the city. From Wellington there are choices as to which way to head north, there are more vineyards through the Martinborough District or follow the coast line up through the middle of the North Island, we chose this way and then had to choose if we were going to visit Mt Raupaehu (maybe snow) and then onto the glow worms at Waitomo caves or head straight through to Auckland stopping at Taupo for the night. If you have time, stop at Foxton and see the windmill or Tirau – this little place was just buzzing as we drove through, there are cafes and craft shops lining the main street. Giant sheep dogs and sheep made out of corrugated iron put this place on the map. Great parks for the kids to have a stop and stretch their legs or enjoy a leisurely lunch or coffee. http://tirauinfo.homestead.com/tirau.html for more information about thus quaint little place. The Waitomo Caves are amazing and a sight to behold and the black water rafting is an adventure. Check out http://www.waitomo.com/ for more information. We drove up to the desert region and were not disappointed with the sights that we beheld, snow capped Mt Raupaehu was a awesome sight. From the snow capped mountains the road leads to the lakes of the Taupo region. We follow the edge of the lake for about 40 kilometres into Taupo. Stunning scenery as you can almost reach out and touch the lake. Arriving into Taupo we stayed at DeBretts http://www.taupodebretts.com/ another great camp ground attached to mineral pools. The park also had lake views and clean amenties with park facilities for the children. The pool complex contained a range of mineral pools at differing temperatures, fresh water pools, water slides for the children, private bathing rooms and a massage centre. Staying at the park also gives you a discount on entry and they are open 7.30 till 9.30 every day. A great way to finish the day. From Taupo we travelled north through Auckland to a number of beaches just a short drive from the city. New motorways make this trip a quick one, don`t forget to pay the toll at the roadside booths before you travel through the tunnel, an engineering feat!!!!! One of our favourite stops along the way is at Matakana, coincide your trip on a Saturday and stop at the local farmers market and a stop at Ascension vineyard is a must do as well. http://www.ascensionwine.co.nz/home A stop at Morris ansd James pottery and tileworks is another must do. http://www.morrisandjames.co.nz/ Their hand made pots are just beautiful and if you have the time join their free tour which runs Monday to Friday at 11.30. Our favourite beach is Buckleton Beach, this quiet bay provides great fishing, boating, swimming and awesome rock pools for the kids to explore. Close by is Sandspit and Omaha which are also worth a visit. Goat Island is a marine reserve close by and is a great place to visit for a snorkel, swim and to explore the rock pools. The glass bottom boat tour is great to see these protected fish up close. You are currently browsing the archives for the North Island New Zealand Camper Holidays category.